Ceremony’s White Tea Toner is a beautifully curated alcohol-free toner formulated with chamomile, shea and white tea extract to clarify, refine, unblock and constrict pores while helping to promote your skin’s natural radiance and glow. Catering for all skin types, including sensitive, this all natural white tea toner will, keep excess oil under control, cleanse, and prep your skin without harshly stripping your skin of moisture. The luxurious blend of natural ingredients combined with the anti-aging potency of white tea make this toner a perfect primer for make-up application. Ceremony’s all-natural luxurious White Tea Face Cleanse oil dissolves even the most stubborn face and eye make-up with minimum effort. Suitable for normal, combination and dry skin, this highly concentrated oil cleanser is infused with organic sunflower, jojoba chamomile flower oil together with white tea meaning your skin gets all of the anti-inflammatory anti-oxidants and hydration it needs while effortlessly removing your make up. This exquisitely fine, highly soluble oil is instantly removed once rinsed, a perfect first step for your nighttime skincare ritual. 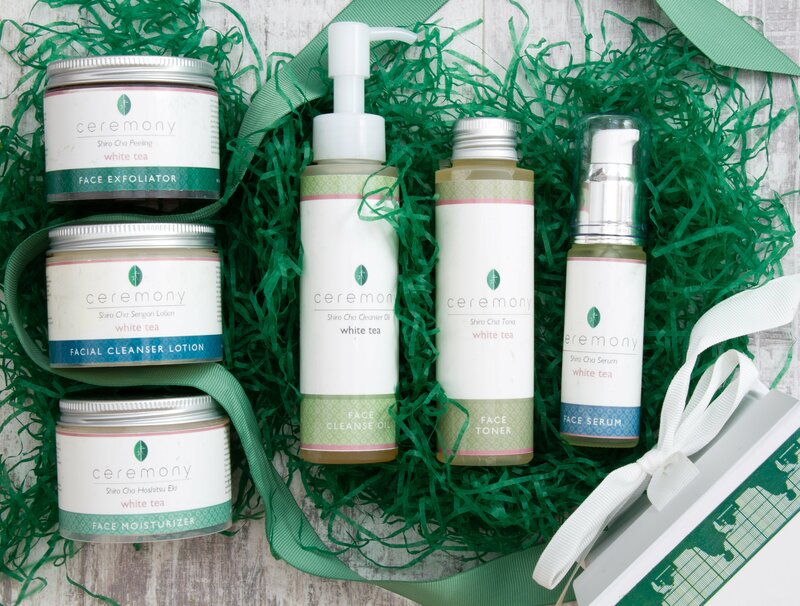 Ceremony’s White Tea Face Serum is a phenomenal all natural skin tonic which blends only the finest active natural ingredients and antioxidants to repair, and combat the signs of ageing. This luxury anti-aging serum will leave you with radiant, healthy, and noticeably smoother skin. Containing the finest white tea extract, the antioxidants and natural ingredients help combat wrinkles, lines, dark spots, to restore a youthful firmness and radiance. Perfect for normal and dry skin, this highly concentrated luxury serum is specially formulated to penetrate deep into the skin delivering the nutrients and vitamins your skin needs on a nightly basis. The exquisite blend of the highest quality white tea and natural ingredients such as rice bran oil, avocado oil, jojoba oil and other goodness will protect from oxidative stress, repair and rejuvenate your skin giving you a radiant youthful glow within a week of using on a nightly basis. Ceremony’s White Tea Face Exfoliator is carefully blended with nature’s finest antioxidants to gently cleanse and effectively buff away dead skin cells. The result is unclogged pores and smooth radiant skin able to breathe. Suitable for normal and dry skin, Ceremony’s white tea exfoliator combines peach seed powder which forms the basis of the scrub, with the finest white tea found in the Pacific coast of Midland Japan. This luxury scrub is packed with other powerful antioxidants and natural goodness like chamomile, and Aloe Forex combat breakouts, dull skin and signs of aging. This gentle but effective exfoliator will leave your skin looking and feeling beautiful. 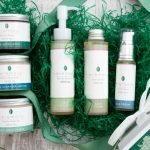 The White Tea Facial Cleansing Lotion from Ceremony allows you to cleanse your face, and feel the rejuvenating effects of powerful oils and plant extracts, a luxurious blend which encourages blood circulation for a revitalizing glow, while locking in moisture to leave your skin feeling clean and fresh. Natural oils such as avocado and olive combined with Aloe leaf and other plant extracts regenerate and heal the skin, while the white tea provides the anti-oxidants to help slow the skin’s aging process. The White Tea Cleansing Lotion also has one more special ingredient: an extract from a rare swiss apple boasts miraculous anti-wrinkle and metabolism boosting properties. Ceremony’s White Tea Face moisturizer harnesses the highest quality white tea extract with other beautiful natural hydrating ingredients to help maintain skin’s suppleness, radiance and firmness. Suitable for normal and dry skin, we have carefully curated of beautiful cast of natural oils such as shea butter, sweet almond oil, along with to complete your daily skincare routine with a luxurious flourish.